Recently, for reasons not clear to us, subscribers to The Daily with email addresses owned by Verizon - specifically verizon.net, aol.com and yahoo.com - are being unsubscribed without their consent. Several have contacted us to complain about not receiving their daily alerts. If you use any of those addresses and you wish to continue, you will need to resubscribe using a different email address. Here's what to do. Weed Stinks Up Roosevelt Island. Increasingly. Back in my day, a term I once swore I'd never use, weed - marijuana - had an easy to recognize odor, one that filled my friend Jon's Ford when we knocked off a high school lunch hour on a first date with Mary Jane. It'd tickle your nostrils at concerts and private parties where hastily rolled joints circulated. But if it stunk like it sometimes does today, I'd have stayed with Ripple, our cheaper and legal alternative. Ten years in place, welcoming arrivals on Roosevelt Island, the Visitor Center Kiosk has tenure longer than many who live here. It's taken for granted by many who forgot what it was like at the Tram or never knew. Historical Society staffers began doing for free what the Island's managers failed to do, that is, welcome visitors and residents alike and answer the steady flow of requests for information. A thoughtful message from the Roosevelt Island Operating Corporation: It’s been more than 30 days since the first day of Spring and last weekend’s long-awaited return of clear, sunny skies signals that the weather has finally caught up with the calendar. At RIOC, with Board Membership reduced to just 5, following the resignations of Margie Smith and Fay Christian, Governor Andrew Cuomo faces a golden opportunity for showing goodwill by acting on a duty for which he's been derelict. Cuomo can reestablish local control of the Board by appointing or reappointing all 9 members in time for the State Senate to confirm them before adjourning in June. The path's clear, if he choses to take it. 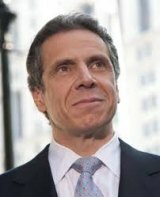 We Support the "Unqualified Lesbian"
Has pressure turned Andrew Cuomo into a political klutz, or has the real man suddenly been exposed? Challenged by Cynthia Nixon in the race for New York Governor, the man who's already in the office fumbled his way through a week in which he snarked Jews and his surrogate, Christine Quinn, opted for gay bashing. Is this New York or what? When I wrote this in March, emotions were swollen in the aftermath of RIOC's brutal hammering of the Roosevelt Island Youth Program. Since, from a ridiculous attempt to evict the cat sanctuary from Southpoint and its aftermath, through the exposing the State's history of filling playground drinking fountains with water unfit for human consumption to destroying iconic trees without forewarning or consent, things worsened. It's time for another look. On Saturday afternoon, I stopped by the Howe Theatre in the Cultural Center to see how rehearsals were going for director Jacqueline Lucid's 1776, the classic Broadway musical about the founding of America as a new kind of nation. The show opens Friday at Main Street Theatre & Dance Alliance. Impressed many times already by the grace and professionalism of productions here, I was still stuck in my tracks, nearly unable to stop watching and go home. Is RIOC Helping Manhattan Park Hide Section 8 Housing Abuse? If RIOC wanted to stir suspicion and mistrust, they couldn't have done a better job than they did last week with a bizarre response to a simple information request.